Aircon Services were recently approached to find a more efficient cooling solution for the Main Data Room at ‘Travelport’ Head Office, Langley, Berkshire. Their data room was being cooled using 3No. Liebert L99UA down flow close control computer room units and their corresponding Leibert HBE99 air cooled condensing units offering a combined Sensible cooling capacity of 255kW spread over 6No refrigerant circuits. The condensing units were located within a purpose built compound at ground level but across a service road. With the interconnecting refrigeration pipe work running through a trench below this service road. Over time the condensing units had become badly corroded resulting in inefficiency through lack of heat transfer. A new solution was required. 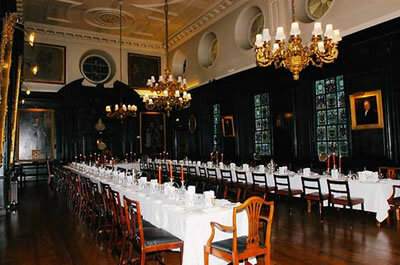 Aircon Services were approached to find a suitable solution to provide a comfort cooling & heating to the Great Hall at The Worshipful Society of Apothecaries a Grade 1 Listed building located within the heart of the City of London. The Great Hall dates back to 1671 when it was rebuilt after the Great Fire of London and is lined with Irish Oak panelling of the same age. Therefore great care & consideration was needed so as not to damage or spoil the fabric of the room whilst discreetly providing sufficient cooling & heating for seminars and meetings.